I love madeleines. I can't say that they are my all time favorite cookie, but I think they're in the top 5. Pretty, scalloped cookie cakes... moist, lemony, light and fluffy... I love my sweet treats and I know that I am more than a bit of a cookie monster but madeleines are so good that I can easily eat 6 or 7 at a time, probably even more, but then I notice the stash rapidly depleting so I force myself to stop (most recipes I've seen only make 2 dozen at a time) and then I stare longingly at the cookie container. Recently, we bought The Williams-Sonoma Baking Book. 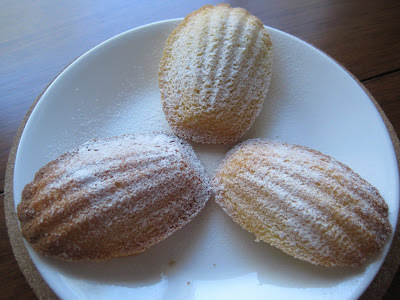 I was pleased to discover it includes a recipe for madeleines - I am always looking for madeleine recipes. This one intrigued me because it calls for cake flour, not all purpose flour, and it just so happens that we have a box of cake flour leftover from last Christmas. 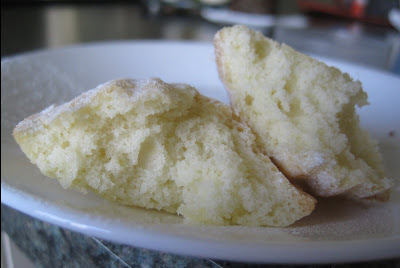 So I decided we should try this madeleine recipe, if only to use some of the cake flour! I was a little hesitant because my usual madeleine recipe is so darn tasty, but who knows, maybe the new recipe would be even better! This recipe also uses baking powder. My usual go-to madeleine recipe uses neither baking powder nor baking soda. Madeleines are easy to make: mix together eggs and sugar then add vanilla & lemon zest: Fold in cake flour, baking powder, and salt: Add melted butter and spoon into greased madeleine molds: Bake at 375 for about 15 minutes. Cool & dust with powdered sugar. Enjoy. These ones are just as tasty as my usual recipe, though I can tell they are different. It's hard to really pinpoint what is different because both taste light & springy & lemony. I guess it must just be the subtle difference in cake flour versus all purpose flour and/or the addition of baking powder. This recipe also uses 2 additional egg yolks, a bit more sugar, and a bit less butter. Both are equally delicious, but I am not sure I would make the special effort to keep cake flour around just for madeleines. 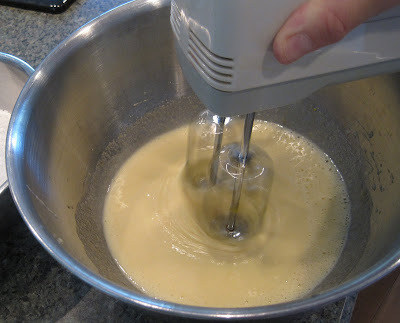 We bought it when we made the Almond Frangipane Palmiers last Christmas and I seem to recall that one box of cake flour costs a lot more than a bag of all purpose flour. 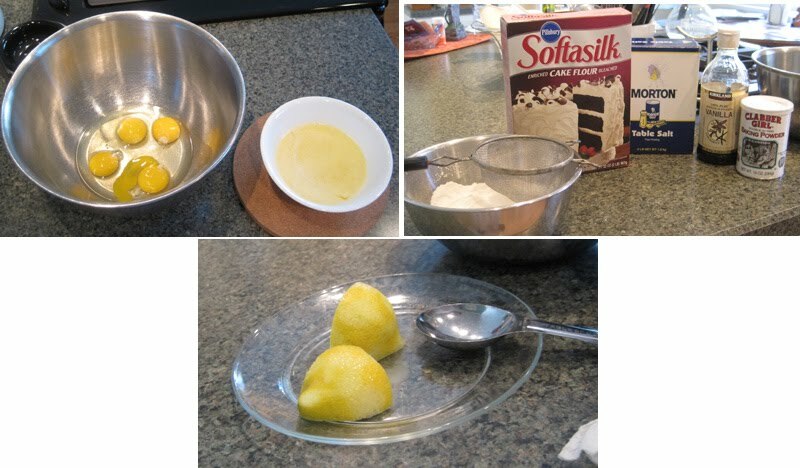 I've seen several cake recipes in The Joy of Cooking that use cake flour, but... maybe we'll see if Costco has cake flour and try more recipes with cake flour! Or, we could try making our own cake flour: Mix 1 3/4 cup of all-purpose flour with 1/4 cup of cornstarch. This yields 2 cups of cake flour. In the meantime, I think it's time for another madeleine treat with my cinnamon tea. Preheat the oven to 375. Generously brush madeleine pan(s) with melted butter and lightly dust with flour. 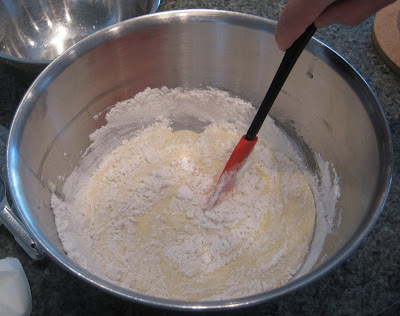 Sift the flour, baking powder, & salt into a bowl. In a large bowl, beat the whole eggs, egg yolks, and sugar until light & fluffy. Add the vanilla & zest and beat until well combined. Using a silicone spatula, fold the flour mixture into the egg mixture. Add the melted butter & fold until well combined. Drop the batter by heaping tablespoonfuls into the madeleine molds, filling each mold 3/4 full. Bake until golden brown and springy to the touch, about 15 minutes. 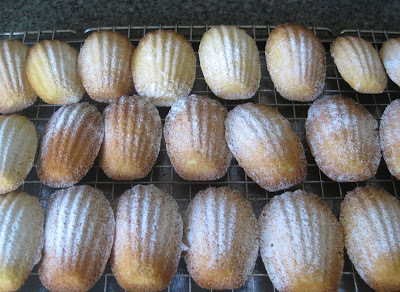 Immediately invert pan onto cooling racks and remove madeleines. Cool cakes completely. Dust with powdered sugar. I love that first image! 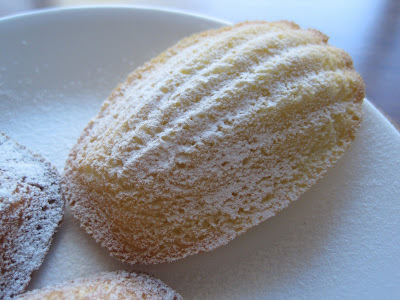 Really captures the delicate texture of a good madeleine...I have been playing around with my own favorite recipe, and came up with...blood orange and honey madeleines. A difference in technique that I like is that the butter is browned, which ups the warm, 'nutty' taste of the cookie.